Alright, I promised a post about wedding registries. I have to admit, as a bride to be, wedding registries and checklists were one of my favorite parts about getting married. I spent quite a few hours on Pinterest looking for good checklists and gathering ideas about what I wanted to register for. 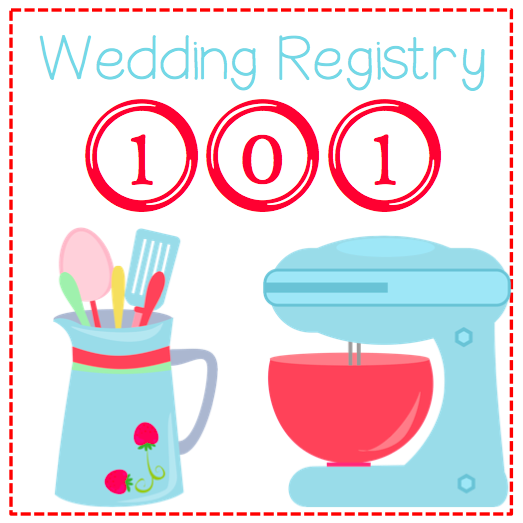 Now that I look back, I have a few hints and tips I'd love to share with you about places to register, the ease of returns (or not, in some cases) and the advantages to some registries after the wedding. When we registered for our wedding, I had been living in an apartment by myself for three years, so the need to register for a ton of stuff was unnecessary. However, I did find that I wanted to update a few of my belongings, as many of them were pretty girly (sorry, Brett!) or they were in need of replacement for better quality, thanks to seeing their better days in college. :) We ended up registering at the following locations. Below you'll find my perks and feedback on many of our registries. By far, the easiest registry we did for a multitude of reasons. Crate and Barrel is super easy to register in store and online. They also have a really great wedding app where you can update your supply if necessary and it notifies you when something is purchased (I liked that part!) The app is called Crate and Barrel Wedding and Gift Registry. You can download it through the App Store. There were A LOT of kitchen items that we got from there, which I was super excited about. Returns were also easy in the store and, their perks are the best. After the wedding they will send you an email for your "complete the registry." However, as long as you have the email code, you get 10% off the entire store, for any reason, online or in store. That made my life so much easier as I was setting up our home. No pressure to use it all in one day or all at once. Besides, it'll be super useful for some weddings and birthdays that are on the horizon! I think if you asked my husband what my favorite store was, he'd probably tell you that it was Target. Target has a lot of cute, practically priced items, and it was a no brainer to register there. Overall, I'd probably give Target a grade of 90% satisfaction on our registry. Some of the pros were the ease of registration. You can always go in-store and get the registry scanner, but if you have the Target app on your smartphone, you can also add items by scanning the barcode on your smart phone and it will add them to your registry. I especially liked that because some items that I saw in store were NOT online, and I could just add them to the registry when I had my phone on me in the store. Super easy. I also liked registering with Target because it was easy access for a lot of people. My biggest frustration with the Target Registry were the returns and the discount for completing the registry. The returns weren't all cohesive, and it was a good thing I brought in some of my gift receipts. Additionally, the discount for after the wedding is good for one day and one online shopping experience. Talk about pressure. I had a few sales I was trying to catch and I didn't have much time to make use of what I wanted. Sad day. One of the most overwhelming parts of setting up our registry was deciding what to register for. I had been living by myself for three years prior to us getting married, so I had accumulated a lot of items that you would typically register for, such as pots and pans, knives, plates, and linens. However, I didn't want to miss out on registering for important items, so I looked over a few checklists to make sure that I included everything we could potentially use. I also took this opportunity to update many of the items that I'd had since college that had seen better days. Visit Katie Sabol's profile on Pinterest.